Bark! 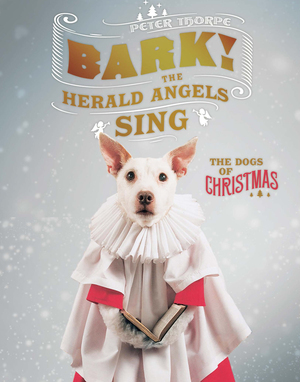 The Herald Angels Sing - Description | W. W. Norton & Company Ltd. Magical portraits of a photographer’s dog in elaborate Christmas compositions. Decked out in Christmas garb, set against evocative backgrounds—from Charles Dickens’s London to the ice floes of Antarctica—an adorable dog strikes a pose. The scenes aren’t always ornate: Peter Thorpe’s first dog Christmas shoot involved his dog, a pair of antlers and a red nose. From Rudolph in 1990 to Santa in 2015, his dogs, donned in festive costumes, have adorned cards every December. In Bark! The Herald Angels Sing, the photographs—and outtakes—include Paddy as a tree-topper and Raggles dressed as Ebenezer Scrooge. Thorpe made his own sets and props, and used no digital retouching. Describing his inspiration for each card, with humour he suggests how readers might attempt to capture the scenes with their pups.